This was a good year for hits. I had a very hard time choosing just five. Here's what I came up with. #1: My first pair of Ginger Jeans. This pair, and my second pair, are actually the only pairs I own now. I like these the best because of the way they fit; the leg shape of my second pair is bugging me so I should really go back and fix it. This pair is a pull-on pair with a stretchy self-fabric waistband. I really love having them in my closet and I plan to make another pull-on pair this year (as well as another zip-fly pair). 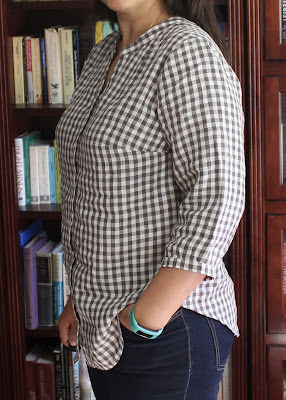 #2: My linen Bonn Shirt. I wear all four long-sleeved Bonns that I have made regularly (less-so the short-sleeved one), but this first one remains my favorite. 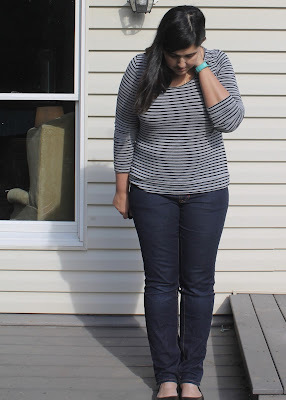 I wear it with shorts, skirts and jeans, buttoned-up, or over tees. It was made from a treasured fabric, and I'm so very pleased with it. #3: My wool Blackwood cardigan. 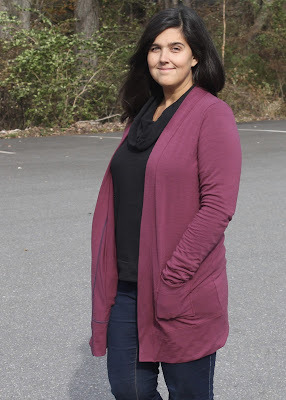 When I first bought the Blackwood cardigan pattern, I didn't think the long view was for me. But then when the weather got colder I found myself dreaming of a long wooly version. I wear this cardigan several times a week now, with jeans and skirts, and I love it. 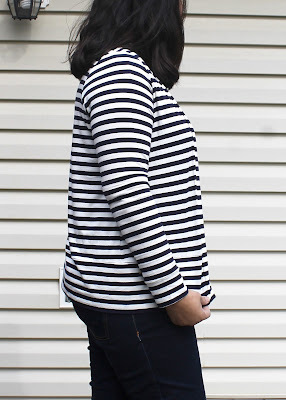 #4: My striped Blackwood cardigan. I have worn the heck out of this one. I've worn it to work just as often as I have stuffed it in my purse to go somewhere air-conditioned. It goes with jeans, skirts, shorts and dresses. The fabric is a really nice quality rayon/lycra jersey that is heavier and more substantial than a lot of other rayons I've used, and I think that is a big part of the success of this garment. I'm actually hoarding the remainder of the cut of this fabric just in case something happens to this cardigan and I have to remake it! 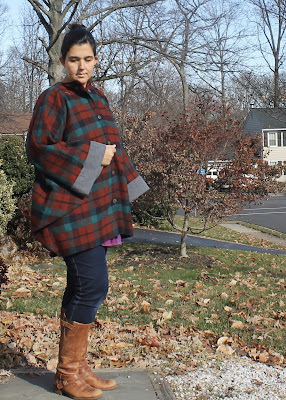 #5: My poncho-coat. I've only had this one for a few weeks but I wear it every day. It's warm and cozy and, I think, pretty cute. My botch-job on the lining does bug me a bit but I can replace the lining in the future. Looking at my top 5 hits confirms that I derive a lot of satisfaction from sewing practical garments that get worn a lot. I plan on making more jeans and Blackwoods, and probably more Bonns, too, in the new year. Coming next week, my 2018 goals and plans. Happy New Year, everyone! So many good makes! Those jeans are spot on! I hope to make some Gingers next year and would be thrilled if they turned out that good! And yay for cardigans! I made some Jalie drop pocket cardigans and they are definitely one of my most worn items. But then again, I just really love cardigans! Love all your 'hits' - those jeans are very impressive! Your cardigans look great - I'm really going to have to try this pattern one day. Love all these makes, Masha!!! It has been a really great year for you, sewing-wise. I think your many cardigans and many bonns are my favorites, but DUDE, you MADE JEANS! So impressive! Wow, good luck on the move, and I'm really looking forward to seeing all your makes this year, too! Sewing for Kids: Yes, I still do!